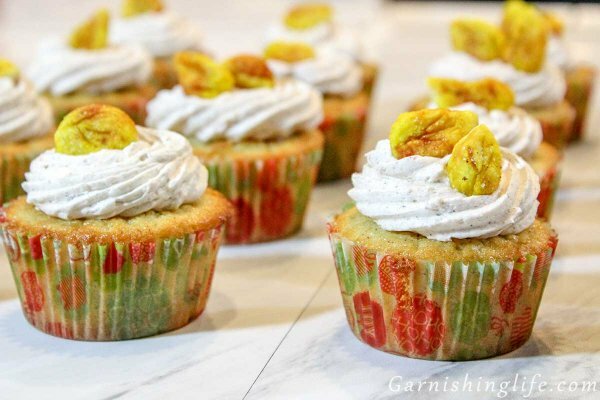 Some of my favorite cupcake recipes are the ones with a surprise stuffed inside. Which you’ve seen with the cupcake variation of my Cheesecake Stuffed Cake. I love the extra flavor and texture, and the surprise from someone trying it for the first time is just everything. 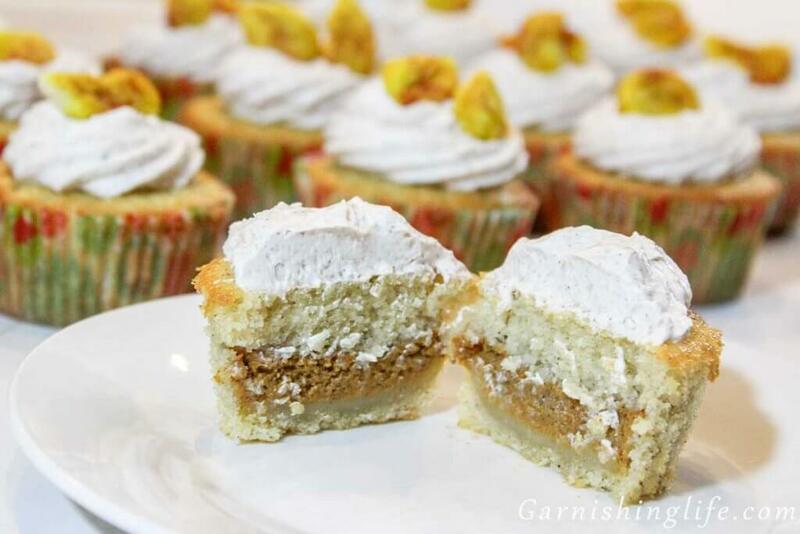 So naturally, I would try to stuff some pumpkin pie in to make Pumpkin Pie Cupcakes, complete with a delicious White Chocolate Cinnamon Frosting. I wasn’t sure if I wanted a spiced cupcake or just a plain vanilla cupcake to compliment the hidden pumpkin pie. I went ahead and used my Rich Vanilla Cake recipe as a base and just altered it a bit to add a subtle spiced flavor to the Pumpkin Pie Cupcakes. So you come out with a sweet, subtly spiced cupcake with a secret mini pie center and the most delicious White Chocolate Cinnamon Frosting. Intrigued? 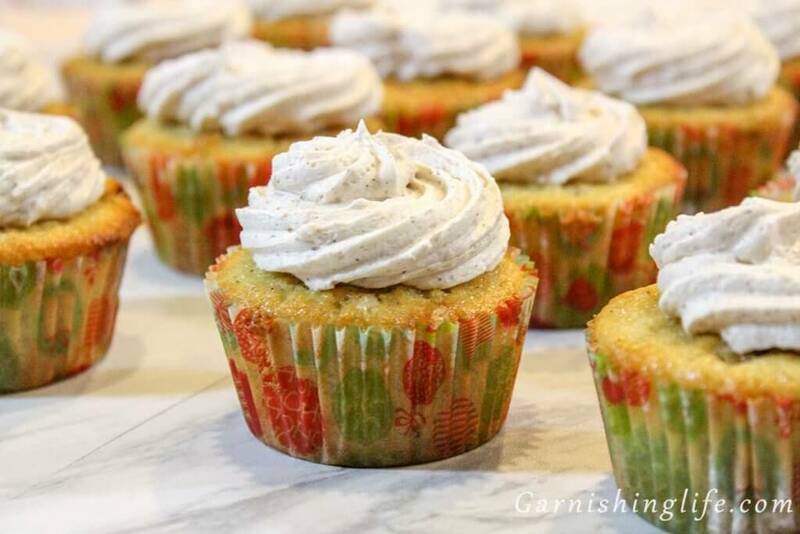 Read on for the secrets to my Pumpkin Pie Cupcakes and White Chocolate Cinnamon Frosting. First, we make the mini pies. As always, preheat your oven first – to 425°. 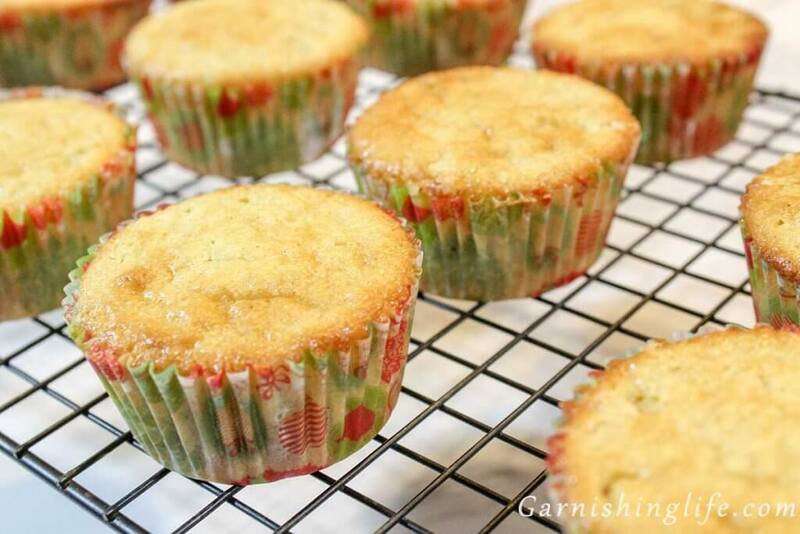 Before you prepare the pies, pick out your cupcake tins. I use a normal cupcake tin for both the mini pumpkin pies and the cupcakes, however one of my tins has a slightly smaller circumference to each cup. This I use for the mini pumpkin pies. I highly suggest you do the same if possible. I don’t prefer to use mini muffin as the quantities will be off, leaving you with extra pie filling- which isn’t necessarily a bad thing. But I like to keep it closer to the recipe. 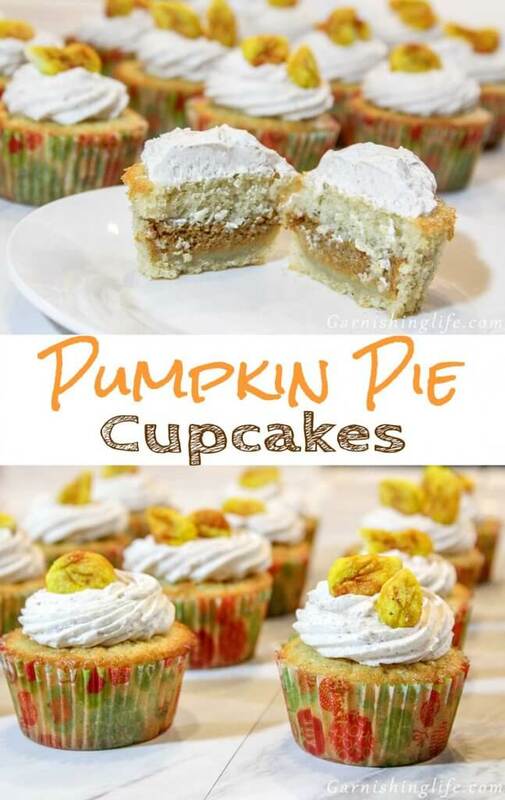 You may also cut just a bit off the sides of the pumpkin pies to fit within the cupcake. Then we prepare the pans. As you may recall, I prefer to use the reusable- silicone cupcake liners and spray those with cooking spray. This is a great way to remove the mini pies from the pan in their full shape. Paper liners are kind of a waste, since you’d have to peel them all off before the pie goes into the cupcakes – and if you just make the mini pies straight into the pan it’s slightly more difficult to remove them in one piece. Let’s avoid that problem altogether and put your liners in the pan and evenly coat with cooking spray. Next, we roll out the prepared pie crust on lightly floured surface to 1/8 “ thick. You may make your own crust or use a store bought premade crust. I will post my own crust recipe in the future, but for this one I just used a premade crust for efficiency. Now, cut out approximately 26 2” circles and press into the bottom of your prepared cupcake cups. I like to use the odd scraps as dough for a cute Garnish. If you’d like to, ball the scraps up and set aside for now. 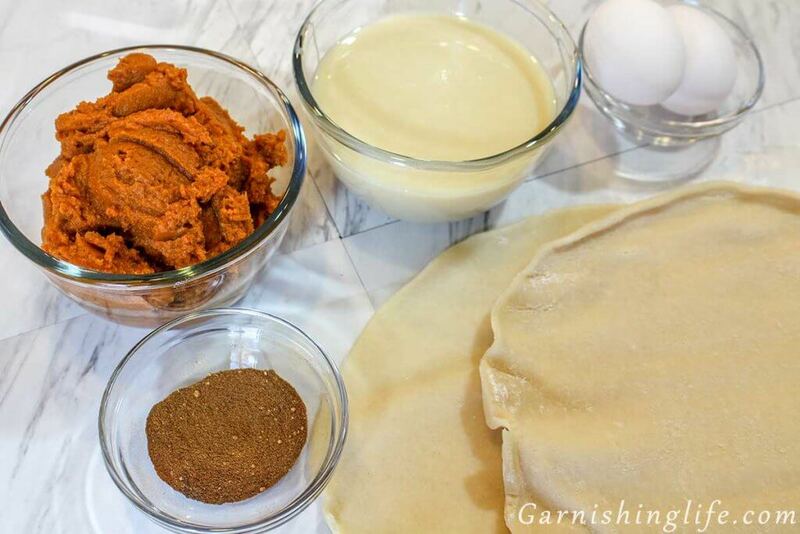 In a bowl, mix all of the pumpkin pie filling ingredients and pour over the pie dough. This only takes about 2 TBS of filling. Now for my own little trick, bake 7 minutes, and then reduce heat to 350° and bake 7-10 minutes longer, until done. Cool pies for 5 minutes before transferring to a wire rack (and removing the silicone liners). I like to keep the pies in the fridge while I prep the rest. If you want to use the dough Garnish, shape them as desired. I like to make little discs, leaves or pumpkins. I’ve used leaves here. Sprinkle some cinnamon and sugar on top and they can bake. Bake dough scraps at 350 for about 5 minutes. They’ll become golden, but keep an eye on them. These are easy to overcook. Now for the cupcakes. Here I’ll use more classic cupcake liners for ease of serving. Grease cupcake pan or use liners. In a standing mixer cream butter and sugar, followed by the egg. In a small bowl whisk the dry ingredients: flour, baking powder, salt and cinnamon. I’ve found that the next step makes cakes and cupcakes so much easier. If you just dump in the flour your dough gets very tough, and if you dump in the milk, you end up with pure liquid. So, I will alternate between adding the milk and flour to the creamed butter. Making sure to begin and end on milk. Don’t overbeat, just mix to combine and keep adding until all the flour and milk is in. 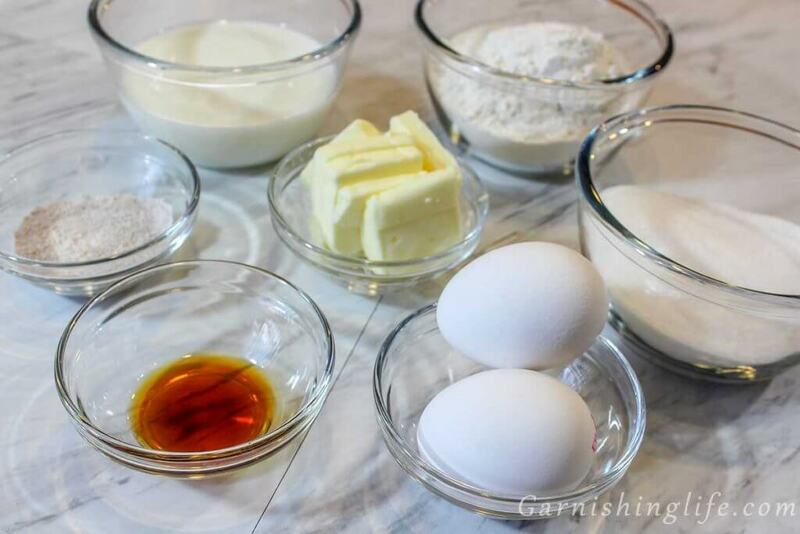 Now we spoon 1- 1 ½ TBS of batter into each cupcake cup to create a base. Then we gently plop a pie on top of the batter in each cup. Try to center it as much as possible to allow for the batter to get around the sides. Spoon more batter over the top to fill the cup about ⅔ full. I like to tap the full pan on the counter to further move the batter around the mini pumpkin pies. Bake 25 minutes at 350°. You can use a toothpick to test the cake itself for doneness, but you will end up getting some pumpkin pie filling on it, instead of coming out clean. Cool in pan for 10 minutes before cooling on wire rack. Now for my favorite part – the White Chocolate Cinnamon Frosting. This flavor is just amazing. And so simple. All you do is microwave the cinnamon and white chocolate chips to get the special flavor. Then proceed like normal frosting. I tend to overwhip my frosting for that melt in your mouth, fluffy treat. Whip the butter until white and fluffy, then slowly add your confectioners sugar. Stir the cinnamon-white chocolate and drizzle into the frosting. Beat the drizzle into the frosting, and continue to whip as you add the whipping cream. Whip for several minutes before topping the cupcake. Then, Garnish with your finished dough scraps. I rushed through the frosting part because I’m so excited for you to see the final result of these Pumpkin Pie Cupcakes! And Voila! You have put a lot of love and care into making a delicious treat with a surprise that everyone will love. Unless they don’t like pumpkin, in which case, they need to get out. Look at how delicious that hidden center looks! 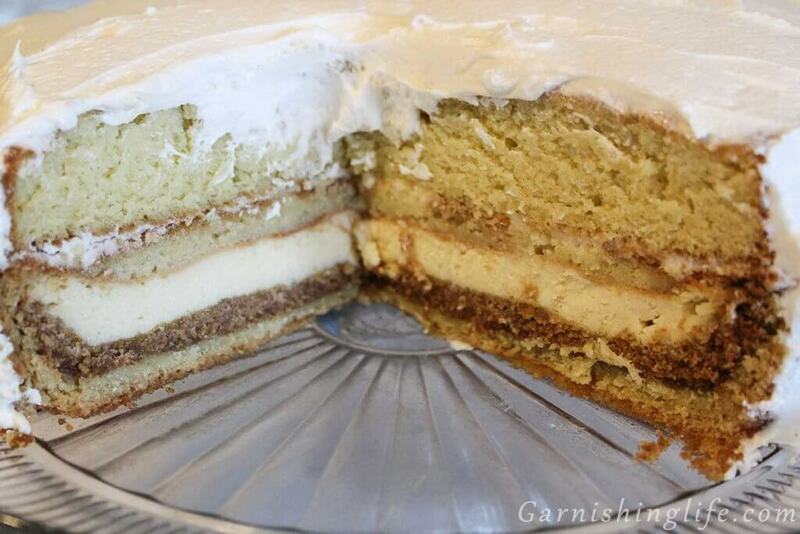 The pairing of the pie and cake and frosting is so good together. It’s like a whole other level of deliciousness. Please let us know how your cupcakes turn out! We are dying to see what you make. Just tag us @garnishinglife and use #garnishinglife on Facebook, Instagram or Twitter! If you like the idea of a hidden surprise, you may also like the Cheesecake Stuffed Cake, which can easily be altered to make cupcakes. 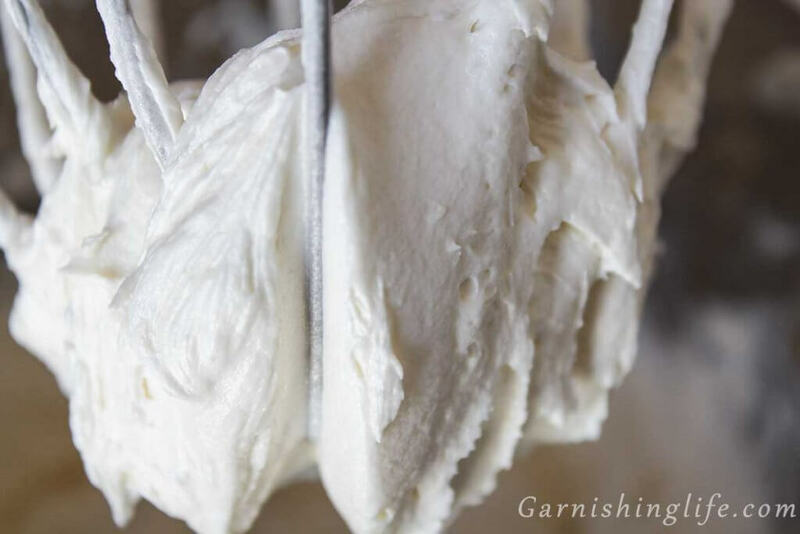 Also, check out my Light Buttercream Frosting for a thorough walk through on how to make the perfect, fluffy frosting. 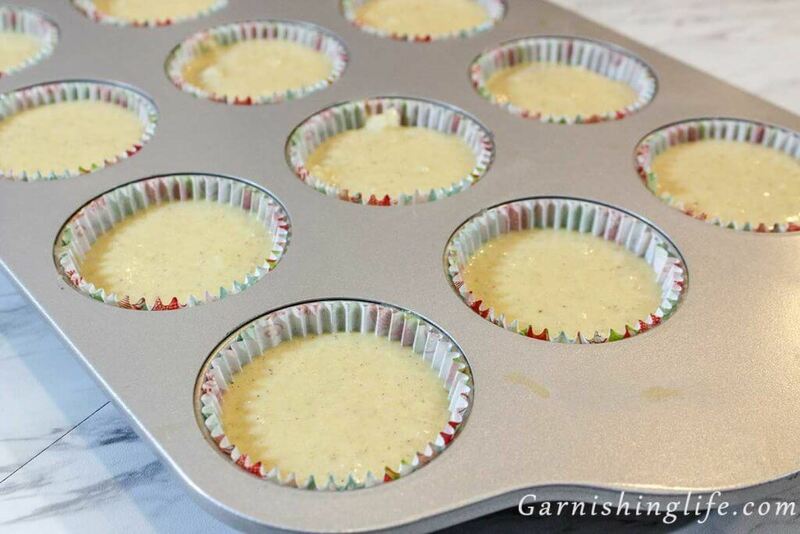 Grease small cupcake tins or use silicone cupcake liners. Roll out pie crust on lightly floured surface to 1/8 “ thick. Cut out 26 2” circles and press into prepared cupcake cups. Ball up remaining dough and set aside. In a bowl, mix all filling ingredients on low until well combined. Top pie dough in tin with 2 TBS of filling. Reduce heat to 350° and bake 7-10 minutes longer, until done. Let pies set in pan for 5 minutes. Remove from pan and liners to rack to cool. Refrigerate pies while preparing cupcakes. Using dough scraps that were set aside, shape into discs, leaves, pumpkins or smaller balls. 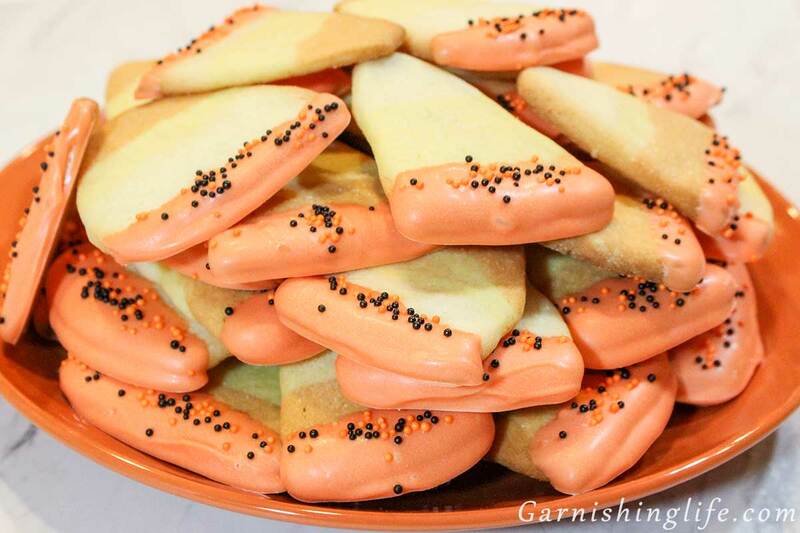 Sprinkle dough scraps with cinnamon and sugar. Bake dough scraps at 350° 4-6 minutes, until golden brown. Grease cupcake pan or use liners. In separate bowl, stir together flour, baking powder, salt and cinnamon. Slowly alternate adding the flour mixture and milk to the creamed batter. Beginning and ending with milk. Spoon 1- 1 ½ TBS of batter into each cupcake cup. 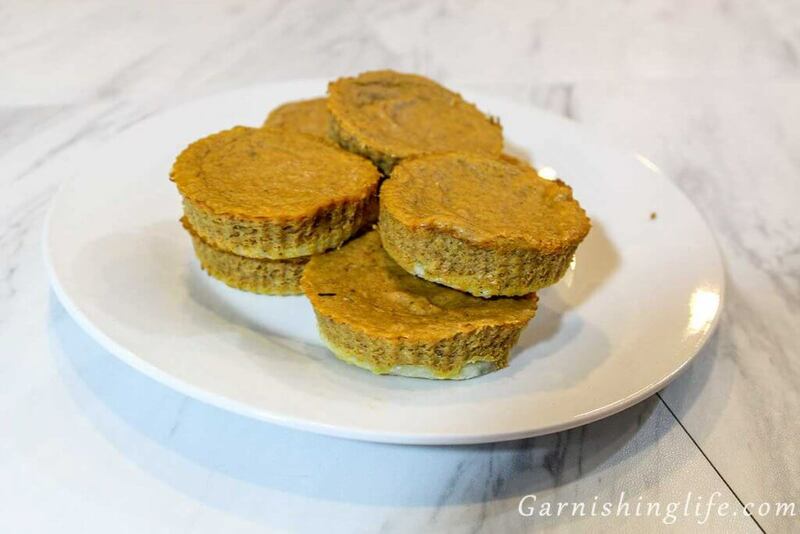 Remove mini pumpkin pies from fridge and gently place one on top of the batter in each cup. Spoon additional batter over the pumpkin pies, to about ⅔ full. Gently, tap pan on the counter to further move batter around the mini pumpkin pies. Bake 25 minutes at 350°. Move to wire rack to cool fully. In a microwavable bowl, stir cinnamon into white chocolate chips. Microwave as directed on packaging to melt chips. Once bowl is cooled, place in fridge to chill. Using the whisk attachment on a standing mixer, whip the butter until white and fluffy. 8-10 minutes, increasing speed from low to medium-high. One ladle at a time, add confectioners sugar while mixing on low. Mix for 10-20 seconds between each addition. Remove cinnamon-white chocolate from fridge and stir well. Drizzle cinnamon-white chocolate into the frosting. Beat frosting on low to incorporate. Whip in cream on low, 2-3 minutes. Increase speed to medium and whip for 5 minutes. 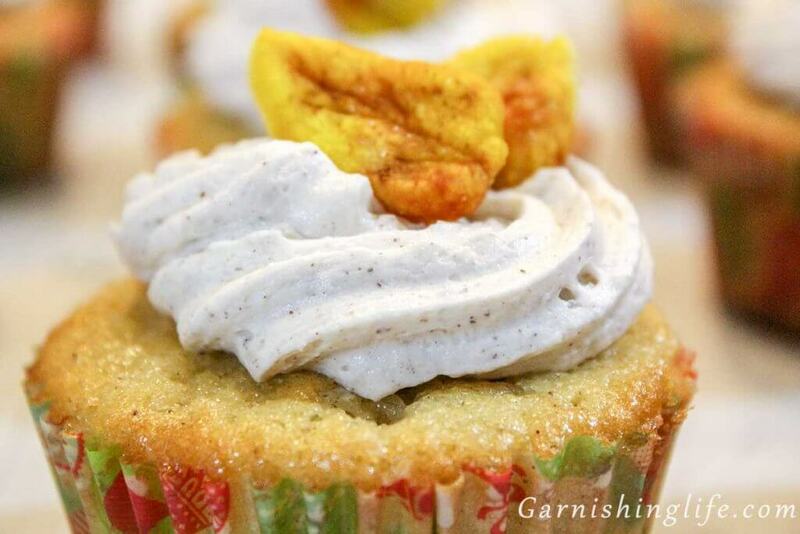 Frost and Garnish cupcakes with baked dough scraps if desired. I use a normal cupcake tin for both the mini pumpkin pies and the cupcakes, however, one of my tins has a slightly smaller circumference to each cup. This I use for the mini pumpkin pies. You may try mini muffin or cupcake tins, but I cannot speak to the quantity of minis you will get out of the batter. 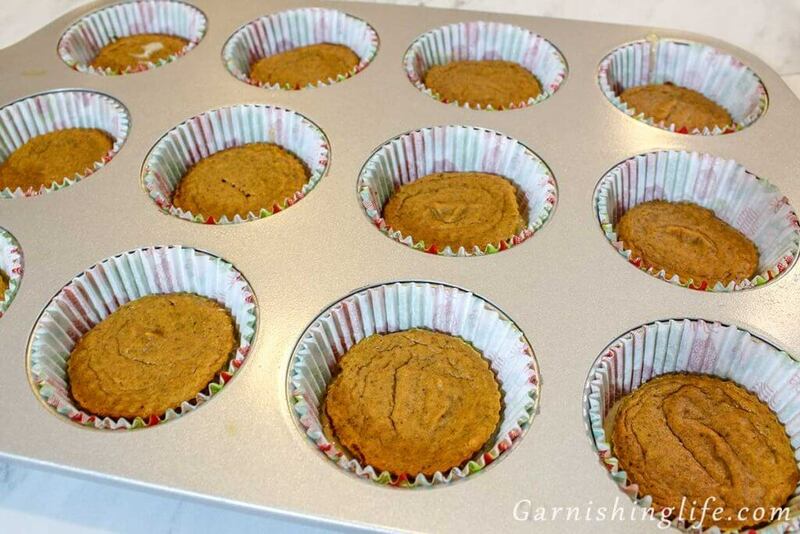 If your tins are identical, you may also cut just a bit off the sides of the pumpkin pies to fit within the cupcake. When baking dough scraps, watch closely. Bake times will vary depending on the shape, size and thickness you went with. Watch even closer if you paint with food coloring as this cooks the scraps even faster. Pumpkin Pies may be kept in airtight container in the fridge for up to 24 hours. When combining dry ingredients of cupcake recipe, I like to stir with a whisk to allow for more movement. 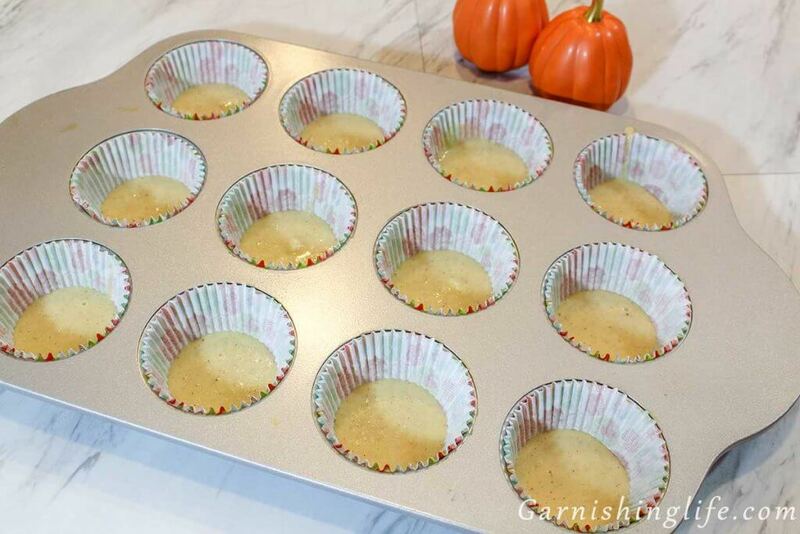 Be sure to place the mini pumpkin pies in the center of each cup when adding to the cupcake batter, to allow the batter to go around the sides. 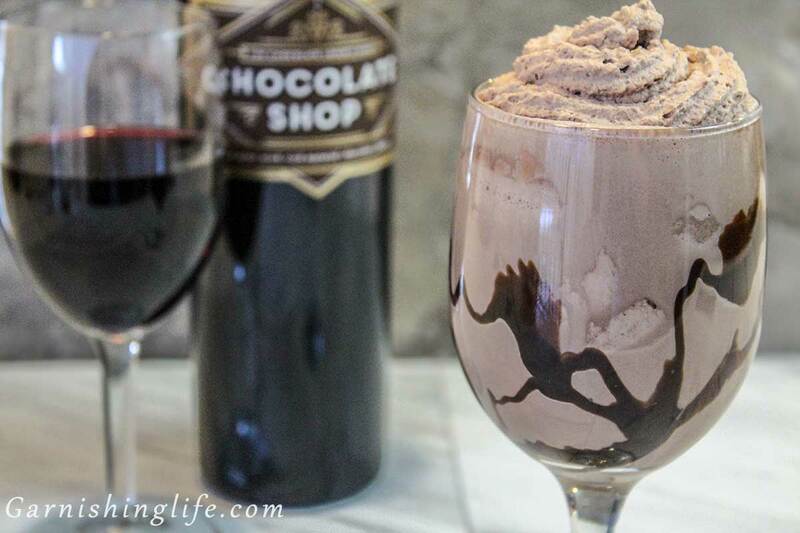 When making the frosting, DO NOT put the hot bowl of chocolate in the fridge, allow it to cool before chilling. If the bowl is too hot, there is a possibility of breaking the glass.